Environmental scientists have come to use the term ‘tipping point’ as shorthand for the time, or set of conditions, at which a rapid phase shift in an ecological system commences. Nearly always, they talk about phase shifts from a preferred to a far less preferred state. Tipping points are bad. But there can be good tipping points as well, when a system suddenly begins to shift from a bad to a better state. Depending on your point of view, the tipping point on a roller coaster is either the start of an exhilarating journey, or a brief moment of abject terror. Photo – Cedar Point, Ohio. There are tipping points also in the affairs of men. (And, yes, the sexism in that anachronistic phrase is deliberate, because most such tipping points in the past have been driven by the actions of male leaders.) 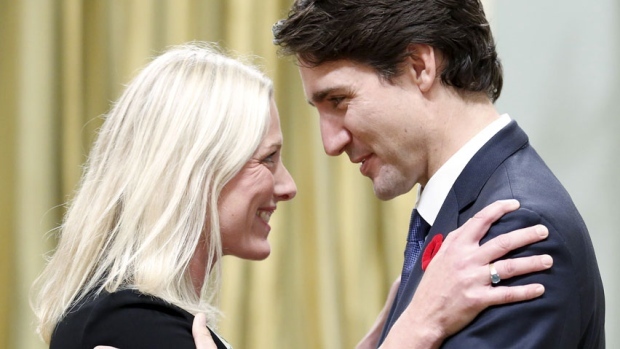 Canada seems to be at a good tipping point in its attention to climate change, under the leadership of its feminist Prime Minister and his female Minister of Environment and Climate Change (I don’t really believe gender or attitudes to same have much to do with this, but…). The change in attitude and the growing momentum for action is very welcome; it is not happening too soon. I first sensed a shift in our national mood re climate back in February. I’ve commented twice on it in this blog. A little over a week ago I participated in the Muskoka Summit on Environment, a two-day, biennial event in this tiny part of central Ontario, and the atmosphere, as well as the comments by the six invited speakers, were uniformly positive about the possibilities for curtailing climate change and the opportunities for Canada in playing a responsible, even a leading role, in that process. The change in attitude from just eight months ago is amazing, and testament to the power of an election to alter a nation’s trajectory. Australia take heed; you’ve been a distressingly effective partner to Canada on the world stage as your leaders and ours jousted in a friendly way to see who could rack up the most Fossil awards at climate conferences, but that duet is over. Now you have the opportunity to continue as Canada’s partner in a completely different performance. A lot will depend on what happens in your coming election, but you too can find your own tipping point to progressive, positive action on the climate file. So, why am I so over-the-moon positive today? It’s not because Canada has achieved some real progress on climate – we are just starting to move. It’s because of the dramatic change in the political conversation. Canada is seriously discussing the inevitability of a transition away from fossil fuels, and the benefits of making that transition rapidly. Two reports became public at the end of May. The first I heard about this was on May 30th when the CBC reported on a draft document prepared by Policy Horizons Canada a Federal think-tank that prepares medium-term policy advice for the government of Canada. This document, Canada in a Changing Global Energy Landscape, reviews the state of the global energy market and trends as various countries transition towards renewable sources. Its major conclusion is that the transition away from fossil fuels is likely to be a lot faster than expected, and that this will particularly affect high-cost fossil fuel producers such as Canada’s tar sands. The authors argue that the transition towards renewables is being driven by three factors: reduction in prices for renewable technology, the growing digital economy, and leap-frogging by developing countries as they add new technology. Advances in technology and economies of scale are reducing the cost of renewables-based electricity far more rapidly than expected, making renewables competitive with fossil fuels for most new supply. The lack of a cost differential both hastens the transition from fossil-fuel based electricity in developed countries and the leap-frogging to alternative sources, skipping fossil fuel, by developing countries. 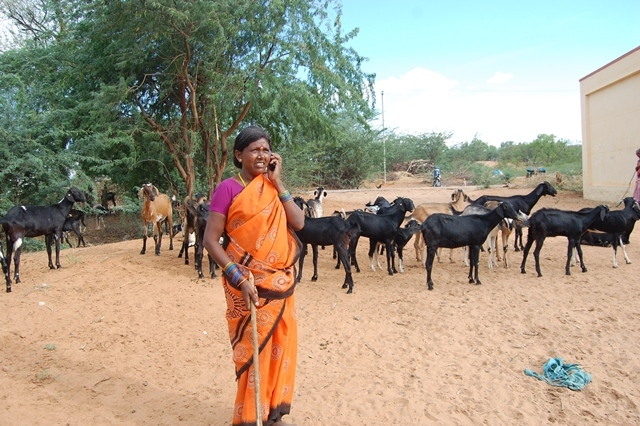 The leap-frogging, which has been seen in such areas of technology as telephones, allows a country to expand its energy supply without increasing greenhouse gas emissions. The growing digitization of the global economy increases the demand for electricity rather than other forms of energy, and electricity can be supplied using many energy sources other than fossil fuels. As a combined result of these three factors, the authors project a rapid transition globally from fossil to non-fossil sources of energy. In such a world, the demand for fossil fuels will remain weak, and countries such as Canada, which produce expensive hydrocarbons will be at a disadvantage. The transition will affect higher-priced producers sooner and severely. For Canada, the most important policy implication is that investment of government funds in the oil and gas sector, including in new pipelines, during this time of transition would be ill-advised on economic grounds alone – the investments are unlikely to recover their costs. The report also notes that Canada is well-placed for a world economy based on renewables-based electricity. We have mineral resources that will be valuable in a new digital economy, and the capacity to produce and export high-value clean electricity as well as the technical proficiency to lead in the development of technology to use electricity more extensively than we currently do – in transportation and in industrial processes in particular. In other words, while an accelerated transition may be bad news for the oil patch, it could be good news for Canada. The second report was published by the Canadian Centre on Policy Alternatives on June 2nd. Titled Can Canada Expand Oil and Gas Production, Build Pipelines and Keep Its Climate Change Commitments?, it was written by J. David Hughes, a widely respected non-conventional fuels authority with 32 years’ experience at the Geological Survey of Canada, and now President, Global Sustainability Research Inc.
Andrew Nikiforuk comments in The Tyee, and Hughes’ article is available at CCPA. Hughes focuses on what Canada needs to do to achieve the commitments already made under the Paris Accord (Canada’s INDC), and various proposals concerning the oil and gas sector. In his first paragraph, he draws attention to Environment Canada’s projection for 2030 – on current policies Canada will be 55% above the level of greenhouse gas emissions it has committed to – and notes that we have ‘some serious work to do’ to achieve our Paris commitments. He then examines in turn several scenarios for the oil and gas sector to 2030 – scenarios developed by the National Energy Board in Canada’s Energy Future 2016 which I discussed back in February – and Alberta’s recent decision to cap expansion of greenhouse gas emissions in the tar sands to 100 Mt CO2eq as part of its new climate change policy. (Emissions were 68 Mt CO2eq in 2014; the new policy would permit continuation of present production and all planned production currently under development but any further expansion would have to use less CO2-intensive methods.) Finally he turns to pipeline capacity versus need to transport product. As in the report from Policy Horizons Canada, Hughes’ argument is not an environmental one. It is entirely based on economics, plus the political requirement that Canada be able to meet the modest commitment made at Paris. His conclusions are very clear. None of the National energy Board (NEB) scenarios for expansion in the oil and gas sector are realistic if Canada intends to honor its commitments made at Paris, and additional pipelines will not aid Alberta’s oil and gas sector economically. Hughes develops a ‘best-case’ scenario which uses the NEB ‘reference case’ and the Alberta emissions cap on the tar sands. This includes just one major LNG export terminal in British Columbia (the province has plans for five terminals). 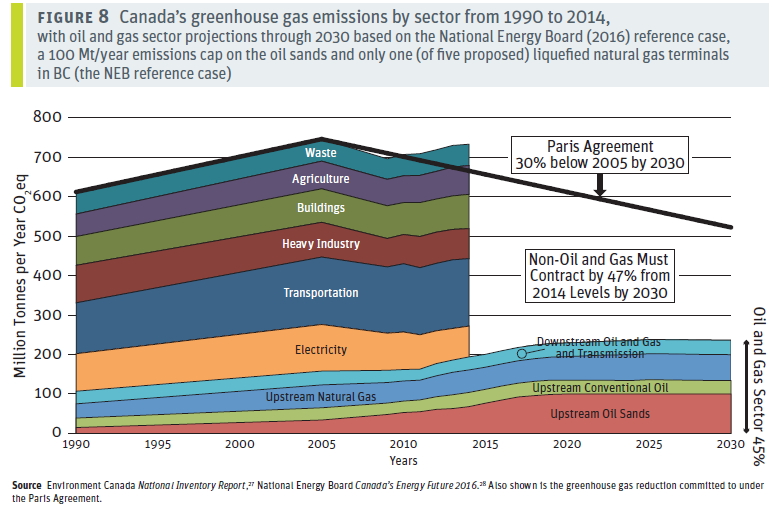 As his Figure 8 shows, under this plan, greenhouse gas emissions due to the oil and gas sector would represent 45% of Canada’s total at 2030, if Canada is to meet its Paris commitment. Hughes’ comments on pipelines are based on the NEB growth scenarios. He shows clearly that Alberta has sufficient pipeline capacity to transport all product if Alberta’s emissions cap of 100 Mt CO2eq is adhered to. Others have shown this before, so his report reinforces the argument being made that new pipelines are not needed in the foreseeable future, no matter how strongly NEB, the industry or the governments of Canada or Alberta lobby for them. Rail transport, which in Hughes’ view is safer and more cost effective than pipelines for shipping bitumen, can be used or not, but the existing rail capacity provides a tidy buffer to manage fluctuations in demand for transport. Hughes goes further and demolishes the argument that getting product from Alberta’s oil patch to tidewater will yield better prices. This was true during the period from 2011 to 2014 when the prices for West Texas Intermediate (WTI) and Brent oil diverged because of a glut within the USA caused by expanded fracking and the US embargo on oil exports. That embargo has been lifted and the glut has evaporated. Yes, Canada gets a lower price for tar sands oil than WTI, but that is because of the greater difficulty and cost in refining this product, not because it is not being delivered to sea ports. Hughes also comments that of all the pipeline proposals, Energy East may seem to make some sense because it will enable oil to be transported to refineries in Quebec and the Maritimes. But in fact, Enbridge’s Line 9, which was recently reversed, now brings western oil to Quebec, and there are pipelines connecting Maritimes refineries with US supply. His arguments support ones made earlier by others. After reading his report, I am even more convinced than I was in February that there is no business case for building Energy East. Putting these two reports together, I am encouraged that arguments are being made on economic grounds that the transition away from fossil fuel has already begun and is likely to move quickly, and that Canada cannot ‘bring back’ the tar sands future of significant further expansion even if it wants to. The message may be politically inconvenient, but it is being made to government and government may have to listen. Far better to plan for an orderly wind-down of the oil and gas sector while building economic strength in other sectors, than to cling to the past and fail dismally. Of course, from an environmental perspective, this is definitely good news. Canada has no hope of meeting its climate commitments (and the even stronger commitments it is going to have to make if the 2oC target is to be achieved) while also growing its oil and gas sector, so any arguments that such growth is unrealistic help move us in the right direction. Beyond these two reports, there are the encouraging signs of new attention to climate coming from various Canadian governments. At the First Ministers’ Summit in Vancouver in early March, PM Trudeau and the provincial premiers agreed that a price on carbon is needed across the country, although they did not agree to a minimum price. British Columbia already has a broad-based carbon tax (although it has stalled at $30 per tonne CO2 since 2012). Alberta has announced a tax ($20 per tonne) which will come into effect on 1 January 2017, with a rebate system set so that 60% of people will not pay any additional tax; the existing emissions levy on large industrial emitters will increase to $30 per tonne in 2017. Ontario has announced a cap and trade scheme, integrated with the markets in Quebec and California that will phase in in 2017. Ontario also has an ambitious climate policy being debated in cabinet, not always in friendly tones, which could include incentives designed to radically reform the use of energy in buildings and in transportation. Quebec has a cap and trade scheme in place and is planning additional measures. Ontario’s plans, which are still under discussion in cabinet, were leaked to the Globe and Mail, and there has been substantial public criticism of the proposals. Inevitably, politics will require some roll-back and some other adjustments. But it is important that planning proceed, and that Ontario remain ambitious. Much of the criticism comes from places that could be expected to complain about any changes to the status quo. While the provincial and federal action are positive signs that Canada is finally getting serious about climate change, there are some vexing problems generated by the fact that, in the absence of any Federal leadership over ten years, provinces have developed their own, not always easily reconcilable policies. While a national price on carbon is badly needed, it will be hard to implement when each province has its own policies some of which involve taxes (even if they are called levies) while others use cap and trade schemes. As Shawn McCarthy made clear in a column in the Globe and Mail back in January, independent action by the provinces has created a balkanized climate regime that mirrors the provincial separation of electricity markets. This is unfortunate, and will make more difficult the development of a nationally equitable system. When one considers that the price of carbon is going to have to rise to several times the currently announced or operating rates ($150 to $180 per tonne CO2 by 2030, compared to current $20 to $30) if Canada is to comply with the Paris Accord, the Federal government has an immense task ahead of it. Prime Minister Trudeau’s noted (and refreshing) preference for open discussion and consensus building is going to be put to a very stiff test. People who want progress on climate will need to stand up and add their voices to support all proposals that seem to be moving us in the right direction. Still, having useful proposals to support is a refreshing change from the bad old days of misdirection and obfuscation. Remember Peter Kent’s famous claim that ‘Canada is halfway towards achieving its Kyoto commitment’ back when we were moving in the opposite direction (growing emissions) and getting ready to renounce that treaty. Growing realism in the oil industry? Perhaps not? While there remain plenty of oil patch boosters in the industry and among politicians, there are signs that recognition of the reality the industry faces may be gaining ground. Speaking to the Canadian Club in Toronto in late May, Brian Ferguson, Cenovus CEO, said that the world is going to continue to need oil for some time and that innovation is needed to make it possible to produce that oil in an environmentally safe manner. He claimed that the industry has “basically solved” the environmental problems related to land, water and tailings ponds, and it now focusing on greenhouse gas emissions. He went on to say that “We can and we will … reduce those emissions,” noting that his company’s goal is to produce oil that generates zero emissions in the production process. Still, the lack of enthusiasm within the industry to invest in the R&D needed to make tar sands product cleaner suggests Ferguson’s opinion remains a minority view. Barrie McKenna’s recent account of the difficulties faced by Nsolv, a Calgary-based company that is running a highly energy-efficient oil sands pilot project in Fort McKay, Alberta. Nsolv extracts bitumen without water and a fraction of the natural gas that other tar sands producers do by injecting warm solvent instead of hot steam into the ground. The operation generates a quarter of the greenhouse gas emissions of conventional steam-assisted projects, and it’s profitable even at today’s low prices. But Nsolv is having great difficulty raising funding from the industry to take its process to commercial scale, and word is the industry wants government to front at least 25% of the total. This should be a no-brainer for an industry tagged as producing some of the dirtiest oil on the planet, and a high-cost product to boot! McKenna refers to the ‘race to be second’ in describing the industry. Meanwhile there is growing evidence of just how environmentally damaging tar sand oil is. A new paper by Environment Canada’s John Liggio and colleagues, published in Nature for 2nd June, reports that Canada’s tar sands industry generates a mass of secondary organic aerosols, an important component of atmospheric particulates, of from 45 to 84 tonnes per day. (A CBC report is here.) This is comparable to the SOA produced by a large city and likely the second largest anthropogenic source of SOA in Canada (10th largest in North America). Toronto, Canada’s largest city, produces about 67 tonnes SOA per day. This environmental impact, the magnitude of which was not anticipated, must now be added to the greenhouse gas emissions, and the toxic compounds deposited on land and in waterways by this industry. It is a dirty industry that should have been cleaned up long ago. Closing it down sooner rather than later will be a good thing environmentally. While I am optimistic about the progress being made in developing Canadian policy on emissions, I am conscious of how time to act is getting shorter. The fires around Fort McMurray were not an isolated event. There were very serious fires in Saskatchewan last year, and this year’s fire season is not yet over. The conditions that made Alberta ripe for wildfire are likely to occur with increasing frequency in coming years if climate change remains unchecked. The Prairie Climate Centre, based in Winnipeg, recently reported on the anticipated increases in days of +30oC temperatures for the latter part of this century. Fort McMurray currently gets about 3 of these days in a typical year, but by 2050 to 2080 that will increase to about 20 days. Other locations across the Prairies show similar patterns of increase. And every serious fire season liberates carbon into the atmosphere. Meanwhile the Arctic sea ice extent peaked at 14.52 million km2 on March 24th, the lowest maximum since records commenced in the 1970s. (The 13 lowest extents have been recorded during the last 13 years!) It is now melting rapidly, and was estimated to cover just 11.1 million km2 on 1st June. On that basis, climate scientist Peter Wadhams of Cambridge University has projected that the Arctic could be completely free of sea ice this September – the first time that is likely to have happened in 100,000 years. 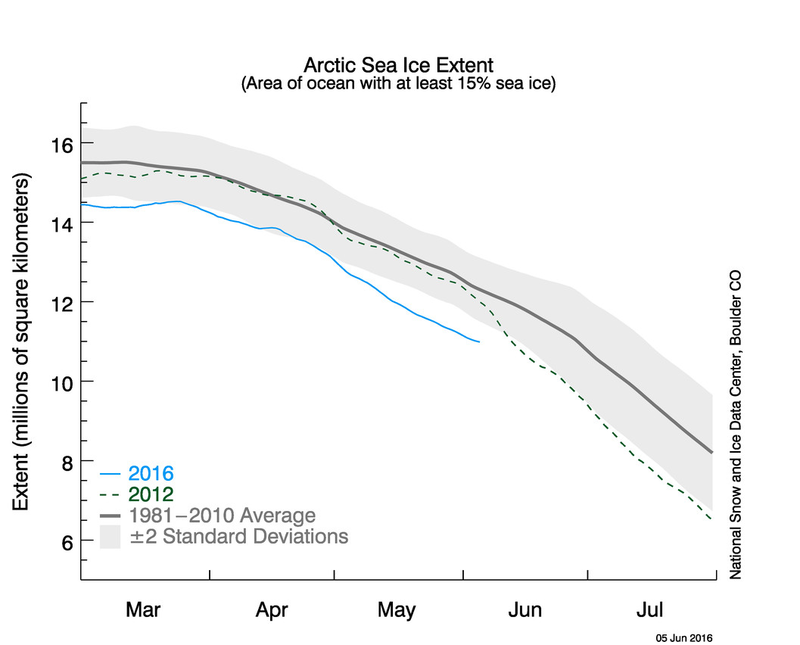 Sea ice extent in the Arctic to end of May 2016, compared to previous years. Figure courtesy NASA NSIDC. 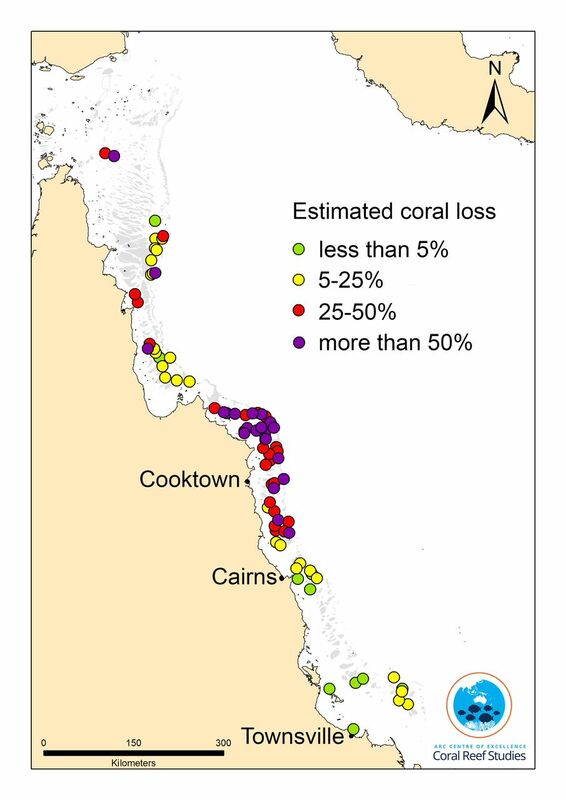 Map showing the northern 40% or so of the Great Barrier Reef, with symbols showing the extent of mortality of corals following bleaching. High percentages of corals have bleached throughout this region, but many bleached corals are able to survive and get resupplied with symbiotic algae. However mortality in the 50% or more range represents severe damage to the reef, damage that will take a decade or two to be repaired in terms of coral cover and physical structure. Repair in terms of full representation of species present prior to bleaching could take much longer than this. Map © ARC Centre of Excellence for Coral Reef Studies. I expect to see a much more detailed presentation of the results when I attend the 13th International Coral Reef Symposium later this month. Ultimately, I anticipate there will be a full report in science or Nature. Stay tuned for more on this issue; apart from anything else, the juxtapositioning of the severe bleaching, new large foreign investments in coal extraction, and a muddled Australian political class that seems to want to have both coal and reefs while minimizing the need to curtail CO2 emissions, is making for a fascinating Australian election season. The evident movement on climate change in Canada is very welcome, but it is also clear that we have not started to move too soon. The task before us is immense, and the impacts of climate change are growing. My next post is going to deal with coral reefs. My intention now is to not have it be about how climate change and other indignities are killing them off, but rather to have it be about the fascinating worlds that coral reefs provide. When I compare our planet to the others that encircle our Sun, I find the magnificence provided by life makes Earth a completely different class of world, and coral reefs are one of the two or three examples of types of place on this planet that should truly inspire awe. Talking about how wonderful they are seems a far better way of celebrating coral reefs than dwelling continuously on the myriad ways in which we are making Earth a less hospitable place for them. Hopefully, I will hear some new stories about reefs at the International Coral Reef Symposium.